Adverse weather conditions may pose serious threats to many aspects of civilization. Quick and straightforward aid is needed after serious storms with catastrophic consequences for people and economies. 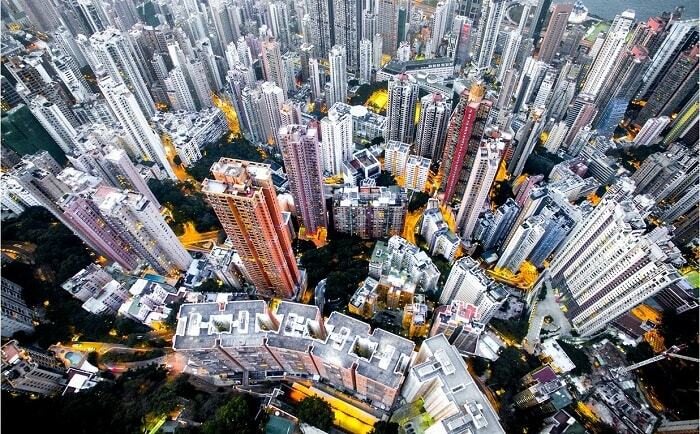 Today, many millions of people are living in megacities on the coast. A sea-level rise would have severe consequences. Also river overflows like in Europe in 2013 cause many homeless people. 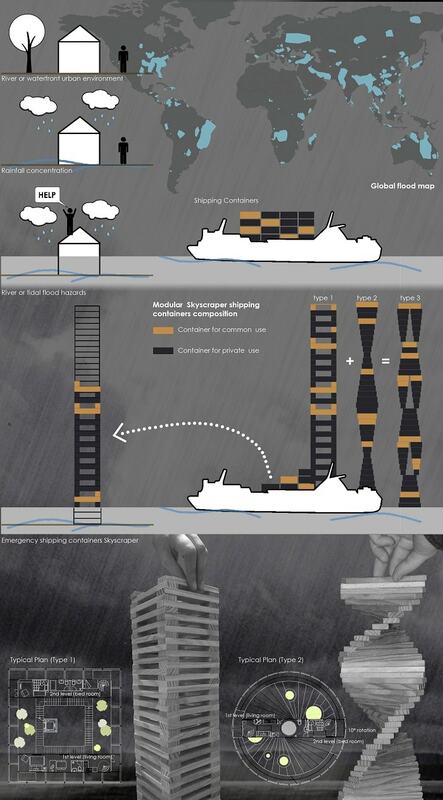 In order to ensure rapid assistance for them, the Kaplasky container skyscraper may be a possible application in the future. 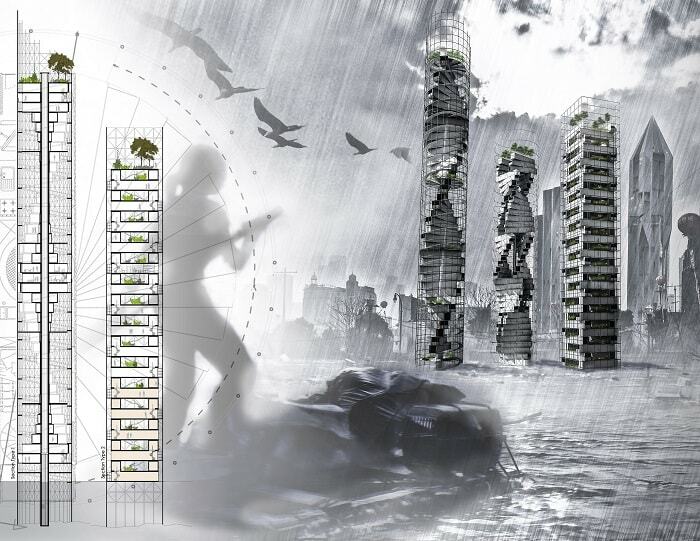 Kaplasky, a proposal for a flexible and mobile container skyscraper, is the latest project designed by the Italian-based architecture and urban planning firm Coffice. The architects decided for a container based solution in order to be highly flexible. The base elements are easy to transport quickly in emergency situations. According to their modularity, they can be assembled without difficulties. Furthermore, they are flexible when it comes to the desired quantity and quality of space. It is possible to obtain different building shapes depending on the applied direction and rotation of the modules. In all three assembling opportunities, as demonstrated above, the containers are embedded in an outer steel structure in order to ensure stability. It also works like a filter for wind and sunlight. The container skyscraper provides space for private housing, libraries, playgrounds for children, meetings, gatherings, etc. The higher the outdoor temperature, the higher the cooling load of a building. Especially in cities, the cooling load can be higher compared to the surrounding countryside because of higher temperatures by 2 to 3 degrees Celsius. Peak temperature differences can be even higher. The urban heat island effect is the reason for this phenomenon. The high concentration of dark surfaces with high heat capacities like roads and buildings absorbs much more solar radiation. Little greenery and no water bodies cause a lack of evapotranspiration which would have a cooling effect. Additionally, many forms of pollution like waste heat from industries, cars and air-conditioning systems are increasing the external temperature. How to determine appropriate urban heat island mitigation strategies? Peak temperatures of 45 °C (113 °F) or more during the summer season cause heavy cooling loads in the United Arab Emirates. 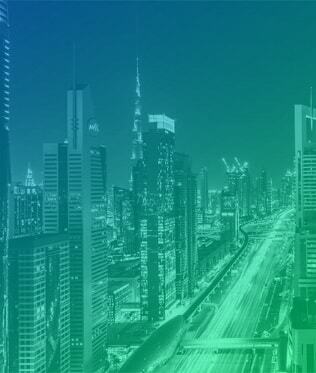 In Abu Dhabi, about 60 percent of the annual energy expenses are caused by air-conditioning systems. It can even rise up to 75 percent on peak days. The urban heat island causes up to 15 percent of the emirate’s yearly cooling load in Abu Dhabi. 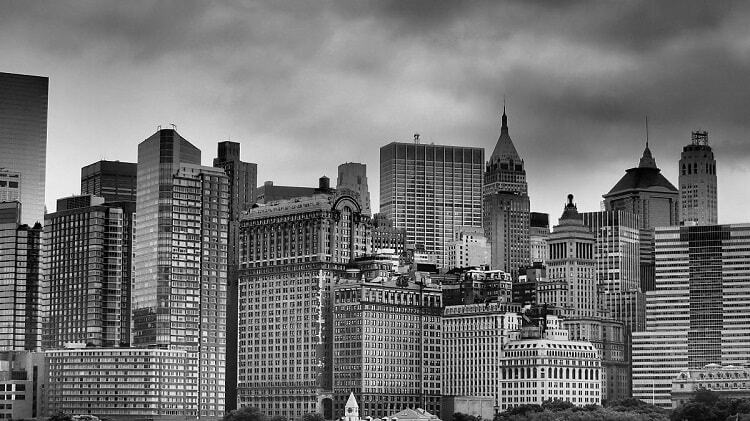 Reducing the urban heat means cutting energy costs. “The more cooling you have, the more heat air-conditioning systems release into the urban environment, which then elevates the ambient temperature and further increases the cooling demand. It’s a vicious cycle,” said Masdar Institute’s Afshin Afshari, professor of practice of engineering systems and management, who is a member of the Masdar Institute-MIT research team. Scientists at Massachusetts Institute of Technology (MIT) and the Masdar Institute, a graduate-level technology university in the UAE, are searching for ways to reduce the urban heat island effect. 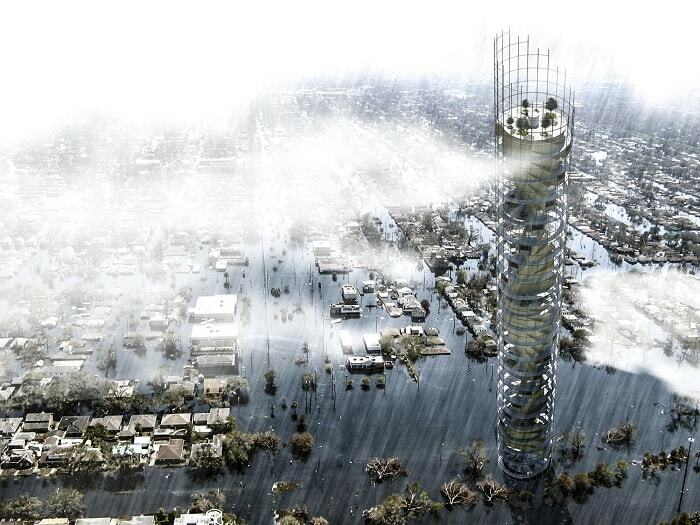 The development of a new three-dimensional urban microclimate model for the downtown area of Abu Dhabi shall enable to investigate the impact of various strategies to mitigate the urban heat island. It could be a valuable urban planning decision-making tool. Influencing factors like geometric effects of buildings, materials, street layouts, green spaces, shading strategies, and water points can be taken into account. According to MIT, the 3-D computational model shows the complex process of heat flows between buildings in Abu Dhabi’s downtown area. It is possible to conclude important climatic variables like air temperature, building façade temperatures, wind speed, solar radiation, and ground temperature. The researchers considered local weather data, the accurate geographical city structure and other remote sensing data. 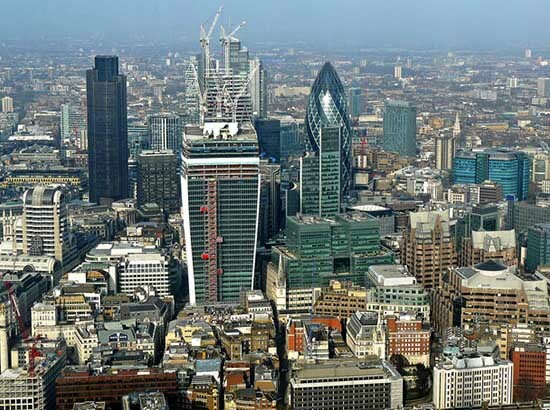 They estimated the cooling demand of the buildings as well as the released heat from air-conditioning systems and integrated the climatic data, building data, and, to some degree, motorized traffic data. To get a clearer picture, more detailed information, and in order to improve the model, the researchers install dozens of in-house developed weather sensors in downtown area. As one might expect, a sustainable building for the tropics has significantly different boundary conditions compared to a building in temperate areas. A major of available information on green building has not been produced for tropic areas. The different climate conditions may not only influence energy-related issues. Also water, wastewater, solid waste, construction materials, indoor environment and local environment can be a subject. The first thing associated with tropical conditions is an higher outside air temperature or an increased air humidity. Indeed, this are two significant differences. Others, for example, may be the sun path, the user behavior, wind and precipitation patterns or the availability of other building materials. In order to investigate this topic in more detail the National University of Singapore’s (NUS) School of Design and Environment inaugurated on 19 November 2015 the Centre for Integrated Building Energy and Sustainability in the Tropics (CiBEST). “The establishment of CiBEST contributes directly to Singapore’s vision of becoming a Smart Nation, as smart buildings and facilities are integral to this vision.” Professor Heng Chye Kiang, Dean of the NUS School of Design and Environment, said. The Centre presently has a team of 36 researchers and is subdivided into two research clusters: Sustainable Buildings and Building Energy Efficiency.  The Sustainable Buildings Cluster conducts research in areas such as green and smart building materials and climatic assessment of urban spaces and buildings in a holistic way. 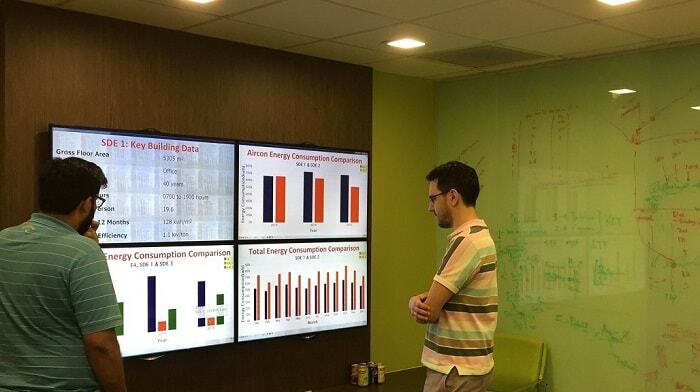 The Building Energy Efficiency Cluster develops expertise in the energy efficiency of various types of buildings. 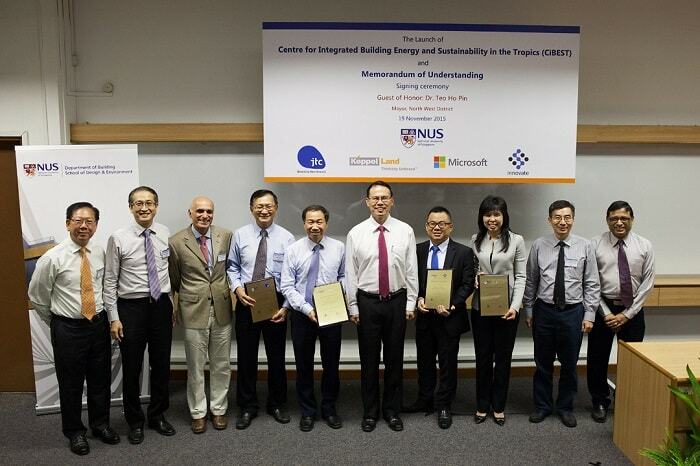 To conduct joint research in the areas of data analytics software, building energy efficiency, energy management and Smart Nation, CiBEST signed four Memorandums of Understanding with Keppel Land, Microsoft Singapore, JTC Corporation, and S3 Innovate Pte Ltd. Thanks to Climate Central for these extraordinary pictures! 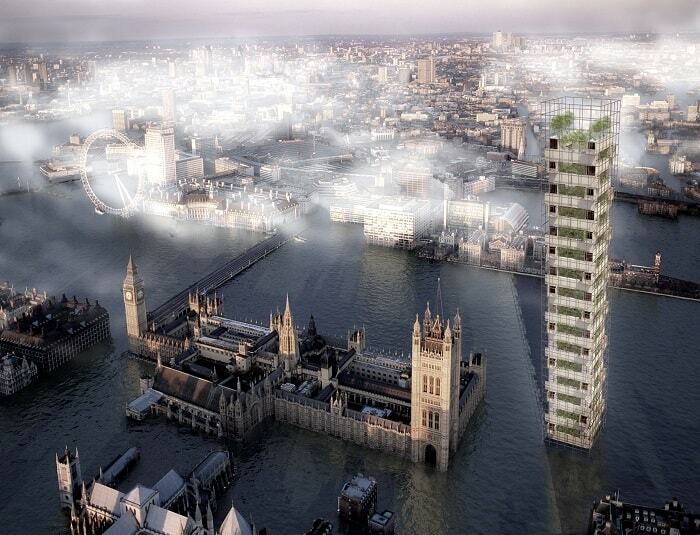 They visualise the impacts of global warming for world-famous cities. You can see yourself what happens with coastal cities like London, Shanghai, Mumbai, Sydney, Rio de Janeiro, Durban and New York. According to a report published by Climate Central, 470 to 760 million people can lose their home globally because of a rise in sea level due to 4 °C of global warming. If we emitate carbon dioxide as usual, the global warming effect will change the world’s coastel cities in a dramatic way. The report ‘MAPPING CHOICES’ builds closely on a paper published in the Proceedings of the National Academy of Sciences of the USA in October 2015. That research used relationships between cumulative carbon emissions, warming, and the future global sea level rise they lock in to assess implications for the United States and its cities. Carbon pollution casts a long shadow. Very likely they persist in the atmosphere long enough to prolong temperature increases for thousands of years, long after human beings stop burning fossil fuels or clearing forests. According to Climate Central, China hast the most to lose from business as usual. 145 million citizens today on implicated land are risked. China also has the most to gain from limiting warming to 2 °C. It could cut the total to 64 million. India, Bangladesh, Vietnam, Indonesia, Japan, the United States, Philippines, Egypt, Brazil and Thailand have more than 10 million people each living on implicated land under 4 °C warming. But better convince yourself and take a look at the interactive pictures below. Climate Central has extended its interactive and embeddable Mapping Choices platform globally. Users can now type in any coastal city name or postal code worldwide, and visually compare the potential consequences of different warming or emissions scenarios on a local map. Climate Central is also serving Google Earth layers for visualizing sea levels associated with 2 °C or 4 °C warming in areas with 3-D building data. Climate Central surveys and conducts scientific research on climate change and informs the public of key findings. The scientists publish and the journalists report on climate science, energy, sea level rise, wildfires, drought, and related topics. According to Climate Central, they are not an advocacy organisation and do not lobby, and do not support any specific legislation, policy or bill. Climate Central is a qualified tax-exempt organization. They also investigate and synthesize weather and climate data and science to equip local communities and media with the tools they need. There is still significant scope for further percentage points when it comes to energy conversion efficiency of a solar cell. Obviously, it is important to improve the efficiency factor to enhance its attractiveness. The higher the efficiency of solar cells the higher the area efficiency and possibly also the profitability. Particularly for cities, the area efficiency is an important point due to the lack of space. A couple of research facilities around the world try to increase the light yield. There is a strong competitiveness. Consequently, new efficiency records are announced regularly. In the following some examples. 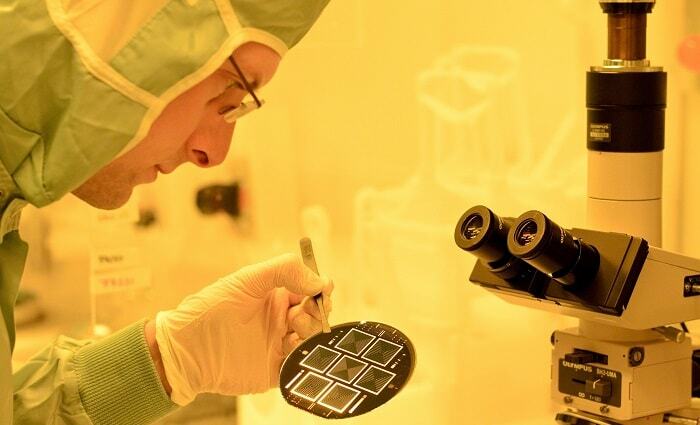 The German research institution Fraunhofer ISE recently announced (September 2015) a new efficiency record for silicon solar cells with TOPCon Technology. 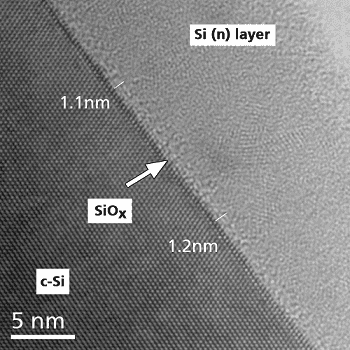 For a both sides-contacted silicon solar cell, an efficiency of 25.1 percent has been achieved. This record is the highest efficiency achieved to date for both sides-contacted silicon solar cells. They are characterized by having metal contacts on both the front and rear sides. “The biggest advantage of our new concept is that we can now contact the entire rear cell surface without patterning. Compared to the high-efficiency solar cell structures presently in use, we offer both a simplified manufacturing process and higher efficiencies at the same time,” explains Dr. Martin Hermle, Head of the High Efficiency Solar Cells department at Fraunhofer ISE. The special feature of the so-called TOPCon (Tunnel Oxide Passivated Contact) technology are the applied metal contacts to the rear side without patterning. TOPCon is developed by Fraunhofer ISE. The researchers developed a selective passivated contact made of tunnel oxide that enables majority charge carriers to pass and prevents the minority carriers from recombining. The thickness of the intermediate passivation layer is reduced to one or two nanometres, allowing the charge carriers to “tunnel” through it. Subsequently, a thin coating of highly doped silicon is deposited over the entire layer of ultra-thin tunnel oxide. This novel combination of layers allows electrical current to flow out of the cell with nearly zero loss. The major solar cells in the photovoltaic industry have an aluminum-alloyed back contact covering the entire rear side. It limits the efficiency. With their latest result, they have surpassed the 25 percent mark. The research was funded within the project FORTES from the German Federal Ministry for Economic Affairs and Energy and U.S. Department of Energy. Solar energy is not available constantly and not everywhere. Artificial photosynthesis is one hope for storing this energy. This is what every leaf can do, namely converting sunlight to “chemical energy”. It can also take place with artificial systems based on semiconductors. First of all, the individual semiconductor components create electrical power with sunlight. The electrical power splits water into oxygen and hydrogen. Hydrogen from sunlight is still a niche within the solar market. But it does not mean that there is no progress. 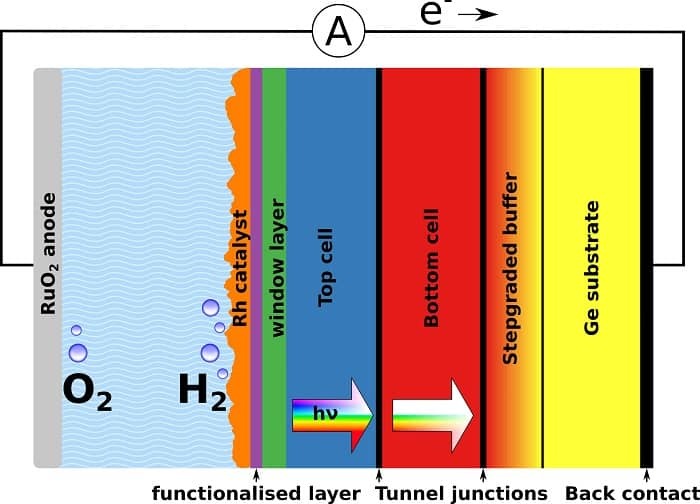 An international team achieved a significant efficiency improvement for direct solar water splitting with a modified tandem solar cell. The old record of 12.4 percent was held by the National Renewable Energy Laboratory (NREL) in the USA. After 17 years a new record value of 14 percent has now (September 2015) been broken by researchers from the Institute for Solar Fuels at the Helmholtz-Zentrum Berlin, the Fraunhofer Institute for Solar Energy Systems ISE in Freiburg, the Technical University Ilmenau and the California Institute of Technology (Caltech). Scientific facilities worldwide have therefore been researching for many years how to break the existing record of 12.4 percent. “We have electronically and chemically passivated in situ the aluminium-indium-phosphide layers in particular and thereby efficiently coupled to the catalyst layer for hydrogen generation. In this way, we were able to control the composition of the surface at sub-nanometre scales”, explains Matthias May, active at TU Ilmenau and the HZB Institute for Solar Fuels. Admittedly, it is difficult for lay people to understand. In former times, the samples only survived some seconds before their power output collapsed. After about one year of optimization, they remain stable for over 40 hours. A long-term stability goal are 1000 hours. The hydrogen generation from sunlight using high-efficiency semiconductors with an efficiency level of 15 percent or more is assumed as being economical. The Eco Solutions Division at Panasonic Corp., based in Japan, announced in October 2015 a 22.5 percent efficiency on a commercial-sized prototype using solar cells based on mass-production technology. Panasonic claims, that the Japanese National Institute of Advanced Industrial Science and Technology (AIST) confirmed the result. AIST is one of the leading centers for independent verification of solar cell performance results under standard testing conditions. The 72-cell, 270-watt prototype incorporates newly developed enhanced technology that will eventually be scaled into volume production. 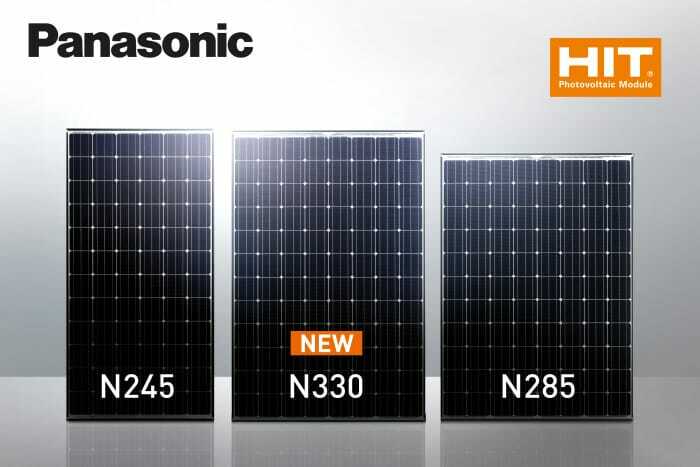 In addition, Panasonic Eco Solutions announced the launch of the powerful photovoltaic Module HIT® N330, the latest addition to the company’s high-efficiency heterojunction photovoltaic Module product line. HIT® N330 achieves 19.7 percent Module-level efficiency with a nominal power output of 330 watts. The new 96-cell Module returns approximately 27 percent more peak-power compared to mainstream 260-watt multicrystalline modules. The new Module will be available in the UK and other European markets from March 2016. 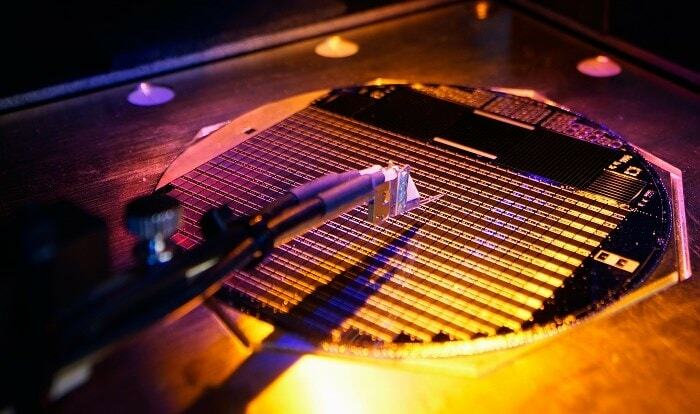 Soitec and CEA-Leti, France, together with the Fraunhofer Institute for Solar Energy Systems ISE, Germany, confirmed a new record for a multi-junction solar cell in December 2014. The cell converts 46 percent of the solar light into electrical energy. Multi-junction cells are used in concentrator photovoltaic (CPV) systems. to produce low-cost electricity in regions with a large amount of direct solar radiation. It is the cooperation’s second world record within one year. It clearly demonstrates the strong competitiveness of the European photovoltaic research and industry. Multi-junction solar cells are based on a selection of III-V compound semiconductor materials. The world record cell is a four-junction cell. One quarter of the incoming photons in the wavelength range between 300 and 1750 nm are converted precisely by each sub-cell into electricity. When applied in concentrator PV, a very small cell is used with a Fresnel lens. It concentrates the sunlight onto the cell. The new record efficiency was measured at a concentration of 508 suns and has been confirmed by the Japanese AIST (National Institute of Advanced Industrial Science and Technology). ”This is a major milestone for our French-German collaboration. We are extremely pleased to hear that our result of 46% efficiency has now been independently confirmed by AIST in Japan”, explains Dr. Frank Dimroth, project manager for the cell development at the German Fraunhofer Institute for Solar Energy Systems ISE. “CPV is the most efficient solar technology today and suitable for all countries with high direct normal irradiance.” Jocelyne Wasselin, Vice President Solar Cell Product Development for Soitec, a company headquartered in France and a world leader in high-performance semiconductor materials, is optimistic that 50 percent efficiency in the near future can be achieved.